Filtrexx will be attending and presenting at the California Stormwater Quality Association (CASQA) Annual Conference in Riverside, CA (October 15-17, 2018). CASQA is the largest professional association dedicated to stormwater quality issues. The annual conference will feature training workshops, technical sessions, and poster presentations on wide-ranging stormwater and water management topics. Description/Abstract: Reduction of pollutants in stormwater runoff is most effective when the discharger's strategy is to combine individual elements and practices into an overall strategy to achieve reductions. 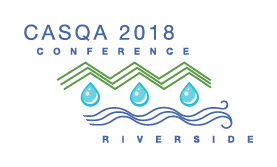 The 2018 California Stormwater Quality Association (CASQA) Annual Conference will be held in downtown Riverside, the heart of the Inland Empire. This year’s conference theme reflects its location in the upper portion of the Santa Ana River Watershed, an area of diverse habitat and extreme topography. The densely populated watershed is home to over six million people in four southern California counties. Here, as in all of California and beyond, stormwater professionals are hard at work complying with National Pollutant Discharge Elimination System (NPDES) permits and Total Maximum Daily Loads (TMDLs), creating urban infrastructure that implements low impact development and reduces hydromodification impacts, capturing stormwater for water supply, and providing protection for groundwater and surface water resources. At this year’s conference we will “connect the drops" by providing an extensive program of training workshops, technical presentations, and posters addressing a range of challenges and opportunities facing urban stormwater practitioners including sustainability, source control, conservation, stormwater capture, communication, pollutant management, and permitting. The conference will highlight the recent integrating approaches developed by the State Water Board STORMS Program and the CASQA Vision to establish stormwater as a vital resource through focused efforts and resources.